If you have always preferred wearing Converse and tracksuit bottoms to pretty dresses and ballerina flats, we've pulled together seven of the coolest tomboy outfit ideas we've spotted this month. From skater sweatshirts worn as dresses to the perfect shirt and trouser combo, these are exactly what we want to be wearing to brunch this weekend. Scroll below to see seven of the best tomboy outfit ideas. 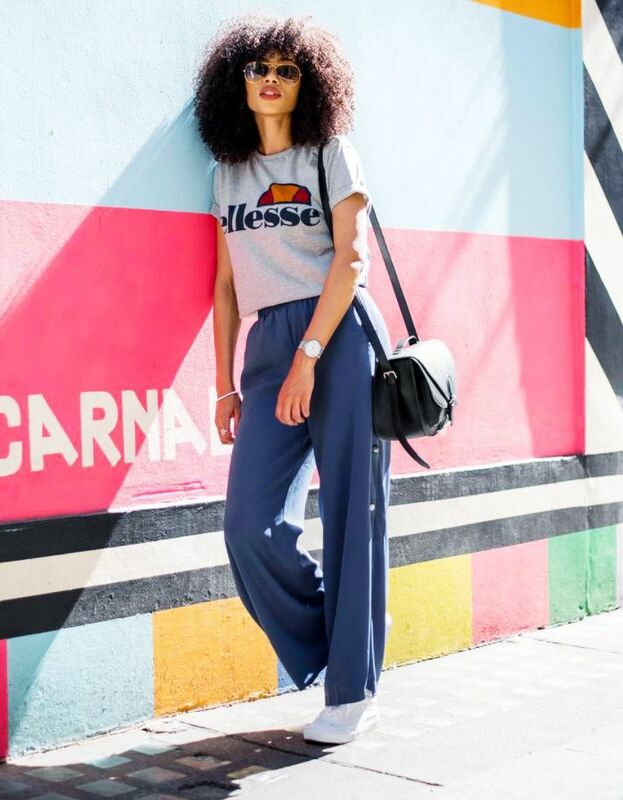 Style Notes: Classic sportswear logos are having a moment once again, and ASOS Lesley pairs her Ellesse logo tee with navy sweatpants and white trainers. An '00s outfit combo that's come back around. Style Notes: Veronika Heilbrunner is one of the best dressed tomboys around, as she lives in Converse and chunky ankle boots. Here she pairs her ripped denim with a graphic band tee and bright-white Chuck Taylors, with the laces tied around her ankles. Style Notes: We love how this fashion week attendee dresses up the boyfriend jeans and band T-shirt uniform by layering a lurex sparkly roll-neck underneath and wearing OTT earrings. Style Notes: Distressed dungarees with a plaid oversized shirt and lace-up Doc Martens is the typical tomboy uniform, but model Imaan Hamman shows it's still a seriously cool weekend option. Style Notes: Linda Tol's striped oversized shirt tucked into paper-bag waist pinstriped trousers is exactly what we want to wear to work right now. Style Notes: During fashion month we noticed that models kept wearing boxy oversized skater sweatshirts as dresses, paired with nothing but trainers. Style Notes: Any tomboy will have a ringer T-shirt and mucky Converses in their wardrobe, and they look effortless paired with a denim miniskirt and a scarf looped around the neck. Next up, eBay sells this one Zara item five times an hour.